For anyone wishing to join our Golden Ears Surrey ride on Friday afternoon June 29 here are the details. Anyone coming in from Surrey or New West Etc. can ride the BC Parkway or Central Valley Greenway bikeways in to Vancouver or take the Skytrain to Waterfront station. This is sort of a follow up ride from one a couple of weeks back where we looked at Vancouver freeway issues. Aim to be at the Waterfront West Coast Express Station early enough to get tickets and find a place to park your bike on the train. You must also buy a ticket to take your bike on the train. There is space for 2 bikes per car just inside the door. Suggest you sit near your bike so it does not get off by itself at an earlier stop. Train leaves at 3:50 pm. The train ride is scenic along the Vancouver Harbour to Port Moody. 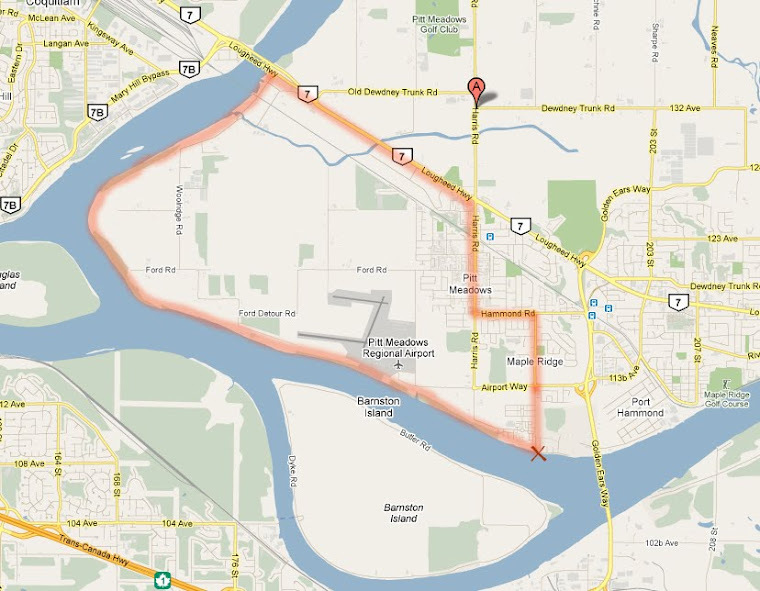 Then over the Pitt River and along through the farms to Pitt Meadows. Get off at 4:38pm at Maple Meadows station. I will be waiting by the Ticket vending machines. As some cannot make it this day we will try to do it again another time in July. While looking out at the new 10 lane bridge being built, we can look at and discuss the industries needing transportation options and alternate ideas to building highways to transport goods and move people. We will pass through the heart of a large industrial area serving the lower mainland supplying goods for all of us and needing transportation options. On the train trip you will view the large bulk goods movement shipping from the ports. And after crossing the Pitt River bridge note on your left the CP container terminal. Most of the containers in this yard have to move by truck through the lower mainland to destinations and ports. Ever puzzled however those coin operated peddling machines came about? you would be surprise to understand that those machines wherever you purchase gumballs and collectible toys start to the first century. If you want to read more about VENDING ROUTE then please click here to continue.